Taking a jackhammer to a shabby-looking room may sound like an ideal way to vent your home decor frustrations, but it's unlikely to solve the problem. 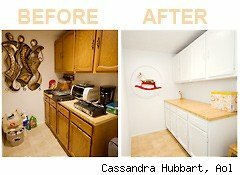 Without breaking the bank and doing a total remodeling job, there are plenty of home improvement projects that can be done on the cheap -- or even free -- to make your home shine. This chore can be done for free, and if you have a successful yard sale, you can even make some money off it. Admit it, the house and garage is an easy place to store stuff that you rarely use or haven't used in years. My rule of thumb: If I haven't used it in a year, it should be thrown out. Some neighborhoods have annual garage sales, and there are charities that will take things in good working order. Even if you don't get rid of stuff, at least cleaning up and putting things away where they'll be out of the way will make a room look a lot better. Rearranging furniture, or moving a table or lamp into a room, can improve the look and feel. And if you have decorative objects that you're tired of, rotate them out and replace with others. A $30 gallon of paint can go a long way, and moving up to our $50 limit can get you enough brushes, rollers and paint to complete a few rooms. "It is one of the least expensive ways to add color to a house," says Leatrice Eiseman, director of the Pantone Color Institute. Start by picking a few color swatches and look at them in the room under different lighting conditions and during different times of the day, suggests Lou Manfredini, a home expert at Ace Hardware. And buy a slightly lighter shade than you want to see on the wall. "Whatever you're painting, when it goes on wet, it's always going to dry a little bit darker," Manfredini says. Ace Hardware sells 4.75-ounce cans of pre-mixed paint, called paint pods, to paint a small area to see what it looks like dry before buying a larger amount. Doorknobs cost about $25 each, so under our budget you'd only be able to replace two. But if you go with handles and knobs for drawers -- cabinets, kitchen, bathroom and other areas -- $50 can buy 10 new knobs to spruce up a room, such as a bathroom. Top Knobs has knobs starting under $4. There are 402 knobs/pulls, etc. in their catalog between $5 and $7.99. The company offers a free sample to try out before buying. The cheapest way to do this is to do what Julie Briggs, who blogs about home decorating on the cheap, calls "shop the house." Swap out accessories between rooms and pull down things you've packed away in your attic or basement. Sometimes a lamp or accessory just needs a different environment, Briggs says. "A few new throw pillows can change the whole mood of a room," she writes in an email. " You can hunt for cheap ones, or better yet cover your existing ones using fabric and fusible tape." Or head to your nearest Target, Pottery Barn or anywhere else that sells home furnishings and buy a few throw pillows. A lamp shade can be accessorized with beads from Michael's to help spruce up the room, says Pantone's Eiseman. To create a meditative feeling, replace a light bulb in a bedroom with a blue bulb, she says. If a vacuum won't get the carpet as clean as you'd like, renting a carpet cleaner should get rid of the dirt that requires a little more muscle power. Home Depot rents carpet cleaners for $25 for 24 hours, and many grocery stores and other stores also rent carpet cleaners for a day. Home Depot's carpet cleaner is small enough to easily move around a room, and has 3.5-gallon tank and brush motor to get the job done. Just as paint can change a mood, so can light. Swapping out discolored switches and electrical outlets for sleeker new ones with dimmers can help conserve energy and bring the light down low for mood effect. Motion detector light switches can also save energy by turning lights on and off when someone enters and leaves a room, and a good one can be found for about $35. This may not make your home look better (although some visitors might be impressed by how it looks), but it will surely make your home feel more comfortable. Digital programmable thermostats can save about $180 a year on energy costs by setting temperatures for when you're home and adjusting them when you're sleeping or out of the house. Here's one for $36 that is Energy Star compliant. For $50, five or six photo frames can be bought and filled with family photos. But better than generic events -- such as weddings, birthdays and other milestones -- fill the frames with photos of good family outings that were full of bonding time, suggests Rivka Caroline, who blogs about space-saving ideas. "What else do you want to fill your house with?" she says. You may already have old photo frames around the house that aren't being used, so save money and use those, or take out an old photo of a birthday party and replace it with a shot of a family camping trip. Another way to display photos is to put up a small gallery shelf that can hold a handful of photos, while adding a modern look to a home, Ace's Manfredini says. This is so easy to do, and there is so much available online that you could spend hours being overwhelmed by the selection. For $35, Art Fire sells an Elvis Presley vinyl decal, which may not look right in every home, but it makes a statement. For a kid's room, a monkey hanging on a branch is fun, and a seagull sun could help put you to sleep. WallPops sells a variety of peel and stick wall art starting at $16. A website called Wallies sells picture frames that can be stuck on a wall, allowing them to be peeled on and off so you can move them to other rooms without leaving nail holes. It also sells 4-inch tile tattoos to spruce up a bathroom. For wall art that isn't flat, try wall decor from Umbra. For $26.50 you can buy a set of 10 laser cut acrylic mirrors with adhesive for mounting. It also sells a set of 25 wall flowers that connect in a single strip for $21, dragonflies for $21, and birds in flight for $21. If you're worried about hammering a few holes into a wall, look for rubberized hangers that keep pictures square or invisa-hangers for hanging non-traditional wall-art. Bulldog Hardware makes both, but they're hard to find online. The invisa hanger is a clear hanging device perfect for use with wall décor where hiding the anchor is not possible, such as wrought iron. Rubberized picture hangers can hold up to 100 pounds. An easy and inexpensive way to refresh a room is to add plants, either from your yard, or from a gardening store, says Jessica Boudreaux, an interior designer. "Do you have a garden or fresh flowers or other greenery growing near your home? If so, cut a handful of flowers or long leaves and put them in a vase or other creative container you already own," Boudreaux wrote to WalletPop in an e-mail message.